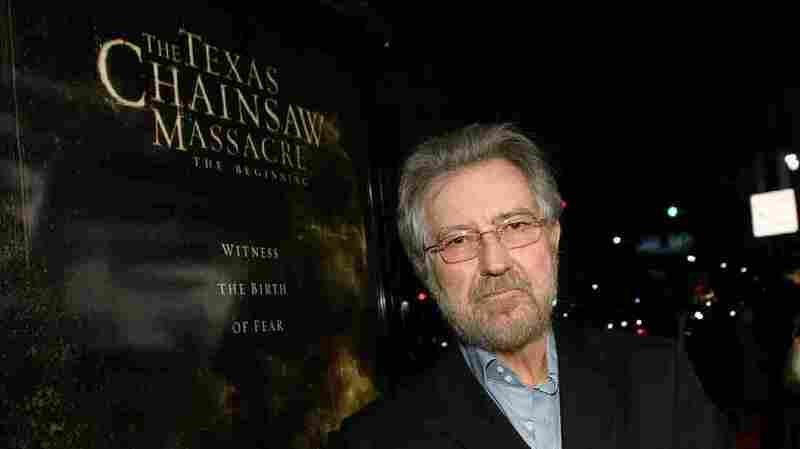 Tobe Hooper, Director Of 'Chain Saw Massacre,' Dies At 74 : The Two-Way Hooper's disturbing horror film, which was made on a shoestring budget, had a lasting influence on the genre. Tobe Hooper arrives at the premiere of New Line's Texas Chain Saw Massacre: The Beginning at Grauman's Chinese Theatre in 2006 in Los Angeles, Calif. In 2004, Texas Monthly magazine reported on the movie's improbable production (and lasting financial woes.) The production crew was astonishingly green — it was the cinematographer's first feature film. There was precisely one chainsaw in the prop collection. The cast members were starving, exhausted and bruised, surrounded by rotting animal parts in the middle of a meltingly hot Texas summer. And Hooper was driving them crazy with his direction. "There's reason to believe that Hooper was manipulating many of the details, to an almost obsessive degree," the magazine wrote. "He wanted the actors to feel irritable and off-balance." Hooper got want he wanted. The film felt real in a way that audiences found both unsettling and deeply compelling. It was even marketed (falsely) as being based on a "true story." The movie's premise is distinctly grisly: a cannibalistic family that kills, skins and eats human beings, turning them into sausages. They live in an isolated house stacked high with bits of corpses. The most infamous character, Leatherface, wears human faces as masks. But despite the subject matter, there's very little blood, guts or gore. In fact, Hooper once told NPR's Terry Gross that he was aiming for a PG rating — seriously. During production, as he was deciding how to frame various shots, he'd ask the Motion Picture Association of America, for tips on what would factor in his favor as they picked a rating. "I called the MPAA and told them what I was doing and said, 'Now, how can I make this PG? I know the concept is rough but let's hypothetically talk about a sequence ... for instance where, uh, a big guy hangs a girl up on a meathook. And if you don't see penetration, and you see the girl hanging on the meathook, and you've suggested penetration in a kind of Hitchcock way, you know. what will I get? Does that get an R? Does that get an X? Or how about PG?' "
The movie ultimately received an R rating. "Had I not sincerely tried to go for a PG, the picture may have been an X," Hooper told Gross. "The film was controversial. Several countries banned it, though the independent film — aided by its gory reputation and lightning fast word-of-mouth — grossed $30.8 million, playing for eight years in drive-ins and theaters. Still, The Texas Chain Saw Massacre wasn't as explicitly grisly as it was reputed to be; much of its humor-sprinkled horror was summoned by the filmmaking and the buzz of one terrifying power tool. "[John] Carpenter, the Halloween director, on Sunday called it 'a seminal work in horror cinema.' William Friedkin, director of The Exorcist, recalled Hooper as "a kind, warm-hearted man who made the most terrifying film ever." "The Texas Chain Saw Massacre wasn't received too kindly by critics. Harper's, for one, called it 'a vile little piece of sick crap.' Roger Ebert said it was 'without any apparent purpose, unless the creation of disgust and fright is a purpose.' But its renown steadily grew, and many appreciated its harrowing craft, comparing it to Alfred Hitchcock's Pyscho ... The Texas Chain Saw Massacre was selected to the Director's Fortnight of the 1975 Cannes Film Festival. Later, it would become part of the permanent collection at New York's Museum of Modern Art." Leatherface has lived on in a number of spinoffs; the franchise is still going. Hooper himself went on to direct Steven Spielberg's Poltergeist, another horror classic. He also directed a TV adaptation of Stephen King's Salems Lot. Variety writes that Hooper continued to work on TV and film until just a few years ago, although "none of the films had the impact of his early works." But Massacre — credited as one of the founding films of the slasher genre — had a lasting effect on horror movies and filmmakers. That wasn't intentional, the director said. "I don't think I set out to change the genre consciously," Hooper told Gross in 1988. "I simply made a film that I wanted to see."